August 14, 1936: In the midst of a sweltering summer heat wave, the temperature reached a record-high 113 degrees Fahrenheit in Kansas City. These high temperatures in the summer of 1936 remain the most extreme in modern North American history. Compounding the problem, virtually no one had air conditioning in their own homes in the 1930s. The consequence was a nationwide death toll of between 4,500 and 5,000 lives lost, making it among the worst natural disasters in U.S. history. For its part, Kansas City merely coped as best as it could. 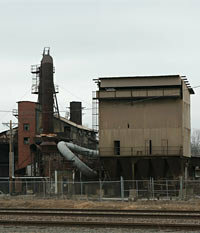 Foundry near Leeds, MO. Photo credit Tom Davidson, Jr.
December 16, 1936: 1,000 employees of the Fisher Body plant located in the Leeds district of Kansas City sat down on the job to protest the recent firing of a worker and demand that General Motors recognize the unionization of autoworkers. What could have been merely a local dispute instead gave early momentum to one of the most significant labor-management confrontations of the twentieth century, the so-called General Motors Strike of 1936-37. February 2, 1940: Senator Harry S. Truman decided to run for reelection despite the possibility that his political career was nearing its end. He faced a tough primary against Lloyd C. Stark, the governor of Missouri who had just led a successful campaign to topple the Kansas City political machine that had supported Truman’s career. In 1936, the machine, led by Tom Pendergast, stuffed so many ballot boxes for Democratic candidates that more votes were tallied than the entire registered population of Kansas City. Cheating at the polls, appointing allies to city jobs, and using city resources for illegal income was nothing short of routine for political bosses of the era, but Pendergast had so far evaded detection by anyone in a position to stop him. Governor Stark assisted the state election board in its investigation of the 1936 voter fraud. Stark then facilitated a federal investigation into Pendergast’s income tax records in 1938. In 1939, Pendergast was indicted for income tax evasion and went to prison for 15 months. December 7, 1940: The U.S. Army Air Corps announced that the Fairfax Industrial District in Kansas City, Kansas, would host a North American Aviation B-25 bomber production plant to prepare for the possibility of the United States entering World War II. 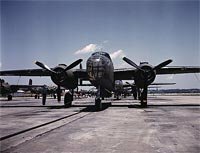 The medium-sized bombers would eventually prove crucial to the American strategic bombing campaigns in the European and Pacific theatres. 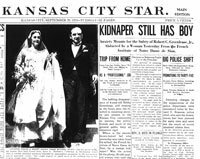 March 2, 1944: The Kansas City school board announced that it would hire married female teachers for the first time due to a workforce shortage caused by World War II. Despite the departure from longtime tradition, the news was hardly controversial because employers throughout the nation were hiring women and minority workers in unprecedented numbers to meet wartime demands. Teaching had long been an acceptable occupation for women, of course, but many school districts of the era barred married women from the profession so that they could concentrate on their duties as wives and mothers. October 21, 1945: John Logan Jones, age 86, passed away following complications from a two-week illness. Although he was not the most celebrated of Kansas City's business leaders, Logan Jones, as he was commonly referred to, was notable for his role as co-founder of the Jones Store, which was the city's most successful department store for much of the twentieth century. 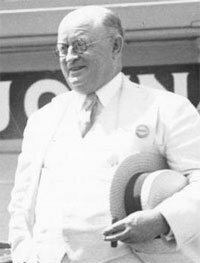 February 16, 1950: Jesse Clyde Nichols, who developed the Country Club Plaza and many housing developments throughout Kansas City, died after a three-month battle with lung cancer. The news about the famed real estate developer’s death quickly spread across the nation and even much of the world. Some 2,000 people attended his funeral at the Country Club Christian Church, where Pastor Warren Grafton, in his eulogy, explained that the best memorial was to simply look around the city and see the influence of J. C. Nichols. June 25, 1951: Following celebrations for Kansas City's centennial birthday, Starlight Theatre began its first season with the musical The Desert Song. Attending the outdoor theatre in Swope Park quickly became a beloved summertime tradition for many locals. Today, Starlight Theatre is one of only a handful of outdoor venues featuring touring Broadway shows. Starlight Theatre's history began in the 1920s when the Kansas City Federation of Music Clubs advocated the construction of a theatre "under the stars." 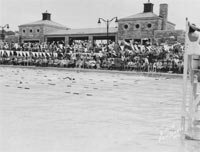 August 2, 1951: Kansas City’s municipal government learned that the National Association for the Advancement of Colored People (NAACP) was filing a suit to force the city to end racial segregation at the Swope Park swimming pool. While not a violent event, the court case soon developed into Kansas City's earliest prominent confrontation over public segregation in the postwar years. When the $525,000 swimming pool at Swope Park opened in 1941, it was the finest in the city. As many as 3,000 swimmers could use it simultaneously. It had modern dressing rooms and refreshment stands. If tired from swimming, visitors could visit other Swope Park attractions, such as the nearby zoo. Unlike many other public facilities in Kansas City, however, the Swope Park pool still officially barred entrance to African Americans. September 28, 1953: Bonnie Brown Heady walked into the Notre Dame de Sion, a Catholic school located in Hyde Park, and told school officials that she was the aunt of Bobby Greenlease, a six year old enrolled in the school. Heady claimed that Bobby’s mother had suffered a heart attack that morning so that a nun would release the boy into Heady’s custody. Heady thus managed to kidnap the boy without arousing any suspicion among the school staff.